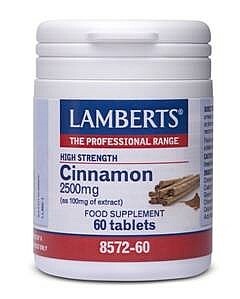 Lamberts Cinnamon 2500mg is for digestive complaints - loss of appetite, dyspeptic symptoms, bloating and flatulence,fungal and bacterial infections of the digestive tract. Evidence has been mounting in recent years concerning cinnamon's effects on maintaining a healthy blood sugar balance. In one study cinnamon was noted to reduce fasting blood sugar levels as well as triglycerides and LDL cholesterol in individuals with compromised blood sugar control. Another study confirmed that cinnamon had moderate effects in reducing fasting blood sugar levels in patients with poor glycaemic control. Some researchers believe that these effects may stem from cinnamon's ability to enhance insulin sensitivity which in turn may improve glucose tolerance. This theory is based on the observation that cinnamon extract increases phosphatidylinositol 3-kinase activity in the insulin signalling pathway, thus potentiating insulin action. Moreover, cinnamon's effects may not only be confined to people with existing blood sugar problems. In a recent trial the effects of cinnamon were assessed on the postprandial glucose response and rate of gastric emptying in healthy subjects. The results showed that cinnamon significantly delayed gastric emptying and lowered postprandial glucose response, compared to placebo. That is, it would seem that cinnamon may be of value for supporting glucose metabolism in healthy individuals as well. Traditionally cinnamon has been used for tackling symptoms of gut infections owing to the belief that cinnamon has antimicrobial effects and indeed recent studies support this. Researchers in Korea have demonstrated that the growth of E.coli cells treated with cinnamaldehyde was dramatically decreased after twelve hours of incubation. Cinnaldehyde has also been shown to inhibit the growth of other pathogenic organisms such as Vibrio cholerae, Salmonella typhymurium and yeasts including Candida albicans. A pilot study on 15 women with polycystic ovarian syndrome (PCOS) showed that treatment with cinnamon for eight weeks significantly reduced insulin resistance. Further studies are warranted to determine whether these results can be replicated in larger groups of individuals. There are different species of the spice cinnamon, two of the most renowned being Cinnamomum cassia and Cinnamomum zeylanicum, both of which are commonly used as culinary ingredients. Cinnamomum cassia originates from the bark of a small evergreen tree that is indigenous to China and surrounding areas; it is the form of cinnamon that has been investigated extensively in recent times and is the species under review here. When choosing herbs and spices for Lamberts® formulas, we always ensure that we use the correct species and the relevant part of the plant. This is why we have specifically used cinnamon bark since it is the bark, as opposed to the oil, that is principally documented for cinnamon’s actions. And we’ve used the same potency of cinnamon extract as the levels used in scientific studies of note but this sadly is not true of all cinnamon products on the market today. Cinnamon is also presented in our comprehensive multi-vitamin and mineral formula, MultiGuard Control® which is designed to be suitable for patients with Type 2 Diabetes, or with Metabolic Syndrome. Our tablets are coated to make them taste free (although they have a pleasant smell of cinnamon) and easy to swallow. As with almost all Lamberts® products, these tablets are formulated, manufactured and packed in the UK using pharmaceutical GMP standards. Calcium Carbonate Cellulose Crosslinked Cellulose Gum Tablet Coating (Hydroxypropyl Methylcellulose Glycerin Colours: Curcumin Copper chlorophyllin Iron Oxide) Silicon Dioxide Stearic Acid Magnesium Stearate.